Wave 2 seems to hit sporadically around the Twin Cities right now. In some places, Legends wave 2 is out in force, but Deluxe and Voyager figures are still scarce. I saw Rodimus Unicronus only once or twice so far. I'm glad I bought him when I found him. Still no sign at ALL of the second wave of Prime Masters, though. I suppose that as my first post on the website, it should be talking about the most recent part of the Generations toy line. From what I've got from PotP, it's pretty interesting. Not Fantastic, but interesting. Leader Optimus is pretty great for being what he is & I do enjoy having him in my collection. Deluxe class figures like Jazz are pretty good, and the highlight for me are the Dinobots. Looking forward to the rest of the combiners in the line. As for figures like Starscream, he leaves a lot to be desired. And while the prime masters are enjoyable to collect, I wish the pretenders had better articulation, or heck, instead of pretenders, just make full scale figures of the primes. The fact that this line is ending this year with the 4th wave is rather disappointing, as this line has so much potential. Here's hoping that War for Cybertron ends up being the reset we all needed for the generations line. Even the wave1 voyagers have been scarce for awhile. I never saw Rodimus Unicronus, and still waiting on the wave2 Prime Masters. what I don't get is, once stores start to get wave 2 stuff, why later to they go back to getting wave 1? Wave 1 pretty much all sold out in my area, wave 2 slowly started trickling in, now were going back to wave 1, and its shelf warming..., at least this is the case with walmart, I don't think Target is having the same issues. o.supreme wrote: what I don't get is, once stores start to get wave 2 stuff, why later to they go back to getting wave 1? Wave 1 pretty much all sold out in my area, wave 2 slowly started trickling in, now were going back to wave 1, and its shelf warming..., at least this is the case with walmart, I don't think Target is having the same issues. It has everything to do with that retailer's distribution system. wish to have seen a decepticon that wasn't a repaint, however can't really think of any character besides megatron to galvatron.. maybe the a seeker into cyclonus? I see this happen a lot too. Wave 2 might have come early, but for it to reach saturation it will take a while and thus the calendar given works without too much gap. william-james88 wrote: I see this happen a lot too. Wave 2 might have come early, but for it to reach saturation it will take a while and thus the calendar given works without too much gap. I am 100% certain thats not how it works. They just order the line and take whatever comes. POTP is a toyline and thats it, they dont distinguish waves. When stock is low, they order more. When they have too much stock they dont order any. It could be all the same figures released all year long (like the disney princesses) or different stock in waves, it doesnt really matter. We know for a fact that this is how they operate since they go by SKU and you have 1 SKU per class per line. It just so happens that of course newer product (from our perspective) gets released after the older product so we see it as new waves. But they just see it as more POTP. And if by wave 3 they see there is too much, then they wont order anymore (especially if they already have order forms for the line after POTP) and that means Hasbro wont send them more and thus the later wave wont appear. william-james88 wrote: We know for a fact that this is how they operate since they go by SKU and you have 1 SKU per class per line. then that is a terribly flawed system. Sure it may work for food, or clothing, or other perishable items, but toys are unique 9as we know). They should be ordered according to UPC (each toys is unique). Of course I'm not one to change the system. Of course I find it odd that we've only had this problem in recent years. Prior to 2005 (the last time I was collecting), I never had a problem eventually finding any TF toy I was looking for. o.supreme wrote: Of course I find it odd that we've only had this problem in recent years. Prior to 2005 (the last time I was collecting), I never had a problem eventually finding any TF toy I was looking for. That kind of says everything right there, doesn't it? You need to remember that the toys are unique to us as collectors, but to a large retail chain, they are just toys from the same group. Actually, I think what you are seeing with Wave 1, Wave 2, back to Wave 1 is likely something that happens at the warehouse level. Lets just think of Deluxes for a minute. Walmart has a specific shelf location for deluxes in their warehouse. Let's say they start off on wave 1 with stores fully stocked plus some additional inventory in the warehouse. When the stores run low, they get more from the warehouse, when the warehouse gets low, they order more from Hasbro. Now, the stores have run through enough of wave 1 to the point where the warehouse needs to order more. Hasbro delivers wave 2 to the warehouse which still has some wave 1 left. They put the new wave 2 on the same shelf as the current wave 1 stock. Since these don't have an expiration date, they might just put them onto that shelf in front of the wave 1 stock (not like food that you have to rotate). This means a store that orders more just after wave 2 is put on the shelf will get wave 2, sell out, order more and get the remaining wave 1. I'm guessing something like that it what you are seeing. This toy just looks goofy all around. Pass. Unicron was born down the street from me. No joke. Battletrap is really, really good. Shame we most likely won't see a 'proper' Flywheel to go with him. Skritz wrote: Battletrap is really, really good. Shame we most likely won't see a 'proper' Flywheel to go with him. Never say never! I'm hoping Hasbro still has some nice surprises in store for us before Power of the Primes is officially done. 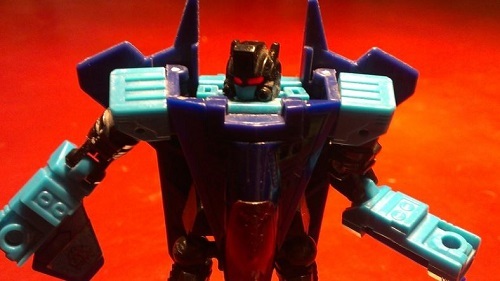 Not to mention the tank portion of Flywheels was very Cybertronian looking making for a good War for Cybertron fit. I could see them being faithful to the tank design and take liberties with the jet mode like they did Battletrap, maybe put the port in the back to look like a jet engine. This listing confirms the name of his smaller form to be (*sigh*) "Nemesis Pax". Autobots and Deceptions use Prime Masters to wield the incredible powers of the most legendary bots in the universe: the Primes. Prime Masters carry the spark of a Prime, allowing them to share a Prime's godlike ability with other bots. Nemesis Prime is an evil clone of Optimus Prime. Fuelled by the destructive energy of the Dark Matrix of Leadership, he is driven to eliminate all in his path. This Transformers Generations Power of the Primes Leader Class Evolution Nemesis Prime figure is a 9-inch-scale figure that comes with converting Evolution Armour. Use the Evolution Armour to evolve this figure from Nemesis Pax to Nemesis Prime. Figure Specs: Modes: robot, tractor-trailer Converts in 35 steps Includes Dark Matrix of Leadership accessory, Deception Giza figure, and a collectible character card Works with Prime Master figures (Not included, each sold separately and subject to availability). Ages 8 and up Warning: Choking hazard - Small parts. Not for children under 3 years. 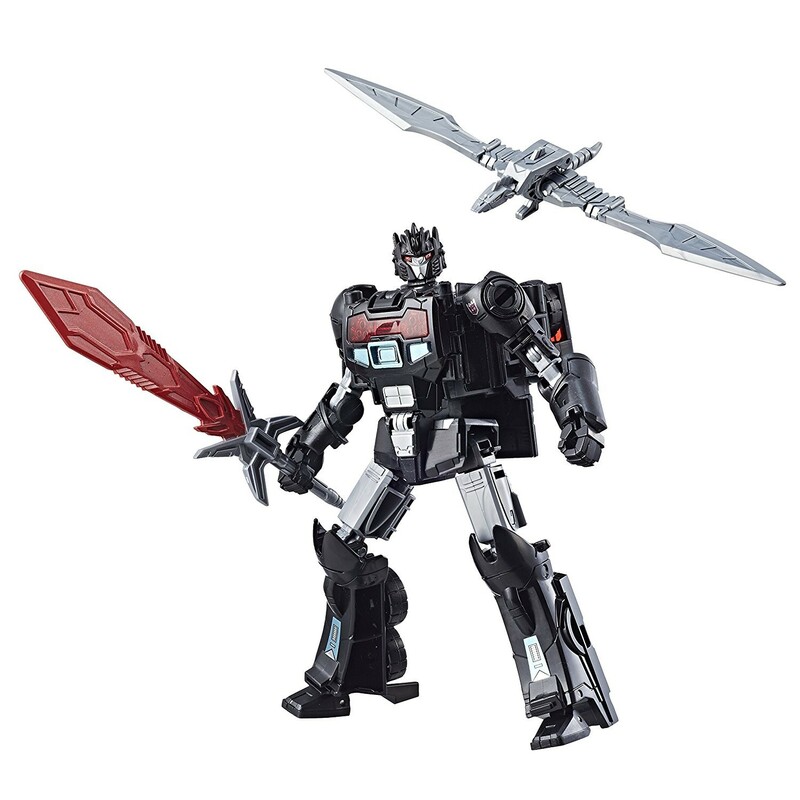 Includes Leader Class Nemesis Prime figure with Evolution armour, Deception Giza figure, Dark Matrix of Leadership accessory, Dark Saber accessory, 2 arm cannon accessories, collector card, and instructions. I guess they couldn't think of a better name then, ah well, that's the good thing of headcanon, we can make him who we want him. 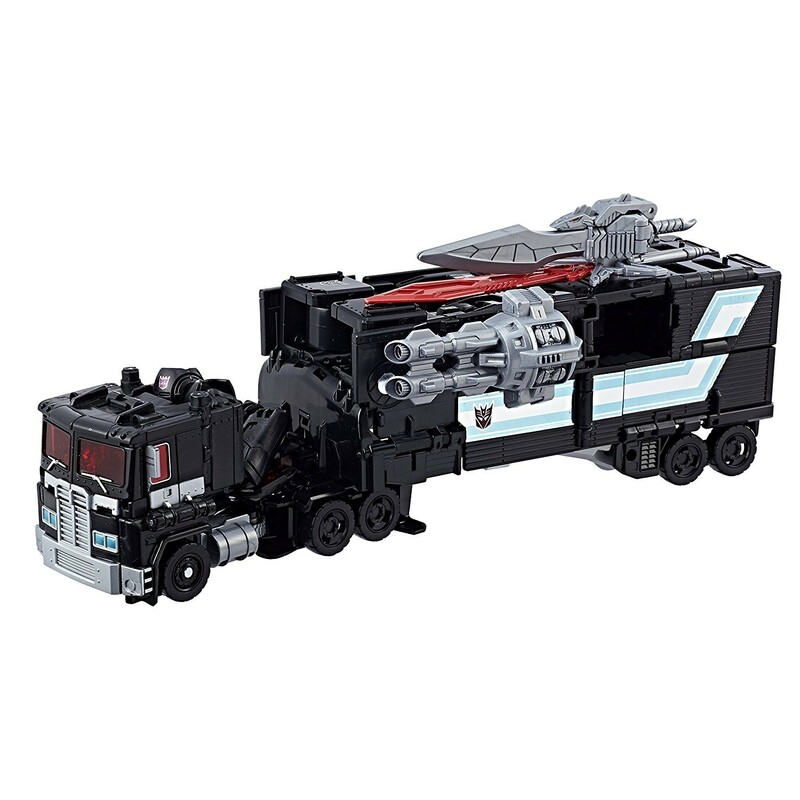 It just occurred to me that if we're getting this then there's really no chance of us getting the mold retooled into Armada Optimus Prime. Too bad. Also, what's with that price? £46.99 seems to be the standard Amazon UK price for PotP Leaders, you wouldn't expect the premium looking NP to be £40.34. I bet his US release wont be less than $50 no matter who's selling it. Also I kinda like the name Nemesis Pax, even if it is a little simple. Pax in Latin means peace so you could translate his name to "enemy of peace". Last edited by Emerje on Sat Apr 28, 2018 12:39 am, edited 1 time in total. 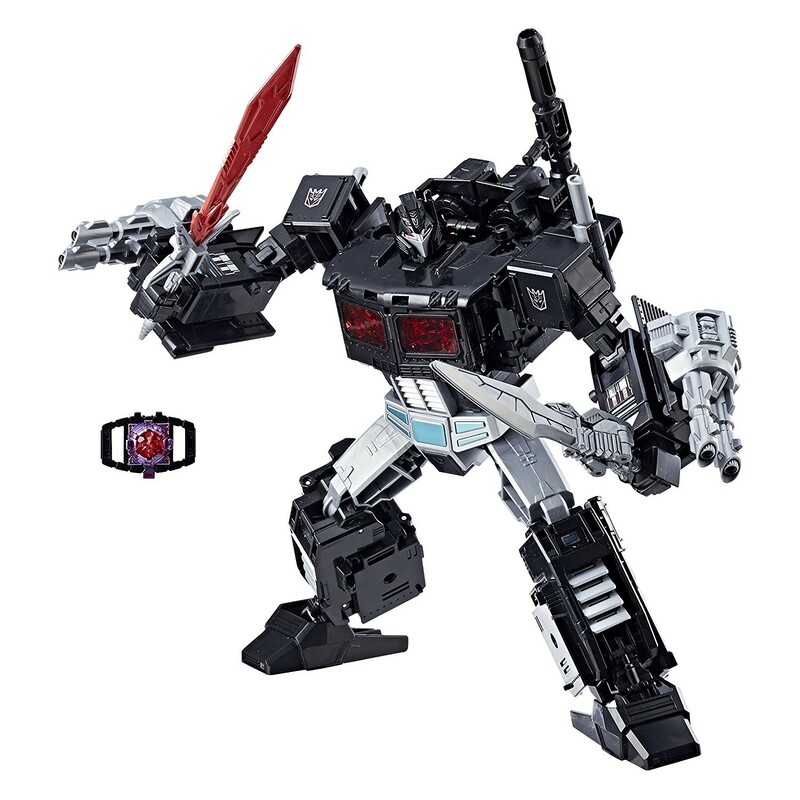 Thanks to fellow Seibertronian Sabrblade and courtesy of the UK branch of online retailer Amazon, we have our first listing of the recently revealed Nemesis Prime figure from the Transformers: Power of the Primes toyline! What the listing confirms for us is the name of the inner robot - Nemesis Pax - the lack of special Prime Master figures, and the weapons and accessories that we saw on the packaging shot back here. Check it out below, and let us know what you think! Spool.... it doesn't have the gun sticking off his back in robot mode? Or at least that's what I'm getting from the description.